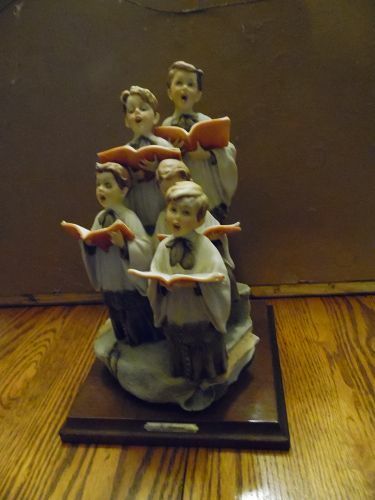 Wonderful vintage Giuseppe ARMANI Choir Boys Large Sculpture/Figurine. #1129 now discontinued. Limited Edition 935 of 5000. Retired in 1996. Made in Italy. Signed on the figurine. Numbered on figurine. No box or certificate. The figurine measures approx. 11 3/4" tall and 6 1/4" wide. Cabinet kept, Excellent condition. Free of damage. Notice the one little choir boy has a black eye and a slingshot at his feet. Inspired by the December 10, 1938 issue of the Saturday Evening Post. Beautiful portrayal of cherubic Choir Boys singing, while depicting their human frailties of normal boyhood. Lifelike faces with vibrant colors throughout. No chipping, cracking, or crazing. A welcome addition to anyone's collection. Item is very heavy but will be packed well for safe travel. Be sure to include your zip code when inquiring so I can get an accurate shipping quote for you.